Hi. Just downloaded a free pack of macros for Affinity Photo for my IPad. It’s a zipped file. Can anyone provide instructions on how to install? 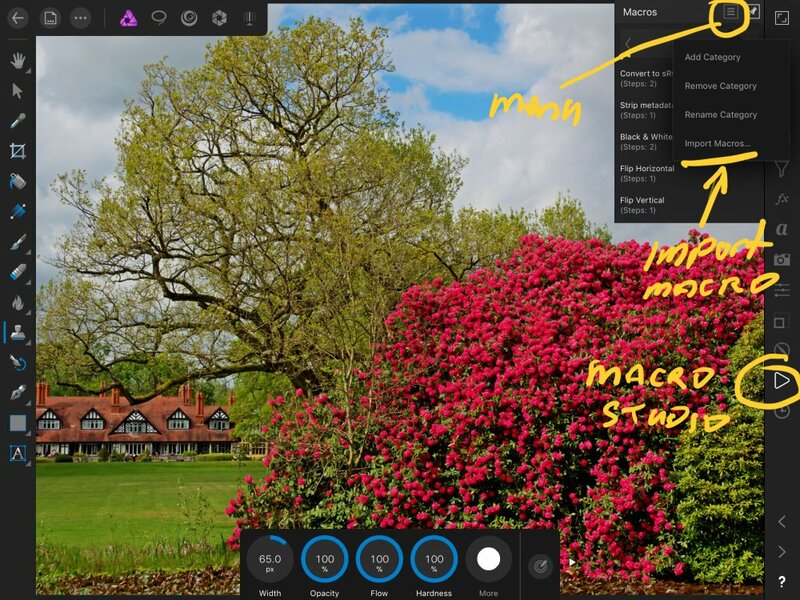 To install the Marco Pack v1 into your iPad Affinity Photo you will need to use a file compression app to extract the zip file and then import the macros using the Macro studio, there a several free compression utilities available from the App Store. Thanks for you replies and help. I still have an issue. I've successfully unzipped the file. I've stored them in my Files Folders in my Ipad. When I attempt to import to Affinity from the Files Folders, the files are all grayed out. Is there an Ipad setting I need to change? Open AP but don’t open a photo proj. Open iOS Files and navigate to the macro. Using Share, and copy to AP, to import the macro. I'm pretty sure you can import macros that way too. 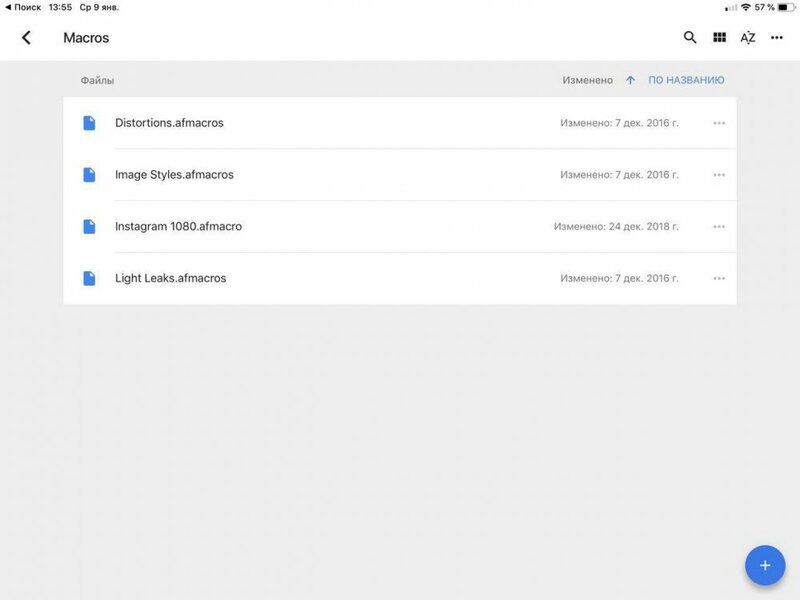 - Allow .afmacros files to be imported from the Files app. Its crucial like DM1 noticed that you have no project open in Affinity Photo. Otherwise you will get an error message. I just imported them by opening the macro in the Apple Files App. All is working now. Thanks all. Hi! I need a help with macros, a fresh look, becouse even after reading this instruction i still can't import macro. I even tryed to rename from *.afmacros to *.macros, and *.afmacro. I exported from desktop *.afmacro (without S). Looks like i read everything about import macros on the forum, like post below, but still can't find correct way. Basically I try to import macros pack from your site. Thanks! Do the following: open a document on Affinity Photo on iPad, tap the Macros Studio icon on the right (looks like a play button - almost on bottom), then tap the small menu icon on the top of the Macros Studio and select Import Macros.... Pick the .afmacros file you have placed on iCloud/cloud service. To access them tap the button on top of the Macros Studio (it probably says <Default>) to open a pop-up, scroll that pop-up and select corresponding section (which are the ones you imported) to display them. Importing macros to the iPad is a little different. Do the following: tap the Macros Studio icon on the right (looks like a play button - almost on bottom), then tap the small menu icon on the top of the Macros Studio and select Import Macros.... Then pick the live-filters.afmacros﻿ ﻿file (you will not see the extension just the live-filters name) you have placed on iCloud. To access them tap the button on top of the Macros Studio (it probably says <Default>) to open a pop-up, scroll that pop-up and select Live Filters (which are the ones you imported) to display them. Thanks! The problem was in place where I stored macros. I stored it in Google Drive vich I can use in Files, but can't import to Affinity Photo(even if I use Files). When I move macros direct to iCloud I could import it.